History should never be boring! 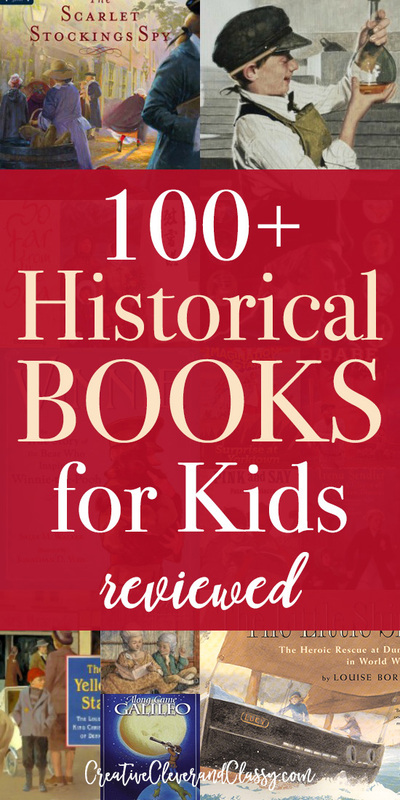 Here is a list of 100 quality historical books for kids, reviewed. I have read most of them, and the ones I haven’t, they look really good and I feel comfortable recommending them. I tried to include a mixture of well-known classics, with many of my little-known favorites. This part covers books for grades 1-4, and includes picture books and age-appropriate read-alouds. This is part 1 of 2. Most know Adventures in Odyssey for its radio broadcast, however few know about their Imagination Station historical series! Meet cousins Beth and Patrick, the Christian Jack-and-Annie from Magic Tree House series. Story settings range from ancient China to WWII. I know some Christians don’t like this book because of the “magic” – but in the original, standard 26 books there is really is nothing occult or witchcraft or anything. Part history, part geography, part science, this series is about time-travelling siblings. 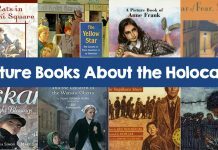 Whether they’re swimming with dolphins, learning with Shakespeare, or helping Clara Barton, this is a great series for younger kids! Explore great artists through the eyes of children! Meet Degas and the Little Dancer, Van Gogh and the Sunflowers, Leonardo and the Flying Boy, and more! If you lived in Colonial times, what kind of clothes would you wear? If you were there when they signed the Constitution you would see what was missing from the Constitution! If you lived during the Civil War, would you still go to school? If you grew up with George Washington, If you lived with the Cherokee, If you travelled west in a covered wagon, If your name was changed at Ellis Island. These are the questions the If You series provokes. Perfect for young kids! Ah, how could I forget these? I LOVE these books, and I think I’ve read almost all of the original 6 books for each American Girl. Also, American Girl has cookbooks and “Welcome to (AG Doll name here” books for a lot of the books. Seriously – so much American Girl fun! Aimed at young boys interested in baseball, these Scholastic books are about the same level as the Magic Tree House series or the American Girl doll series. Each plot revolves around a kid who can travel back in time to meet famous baseball players through his baseball cards. 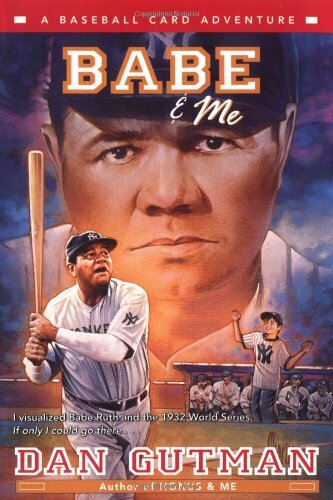 Some of the baseball players featured are Babe Ruth and Jackie Robinson – making this series a perfect way to not only learn about your children’s sports heroes, but to learn how their time period shaped their lives. Credit: LIParentSource.com. I listened to this on audiobook, and I’ve heard others say the audiobook is better than the book. Anyways, I enjoyed this fun book about Rush Revere and his time-travelling horse. A great look into history! There are always two sides to every story! This picture book is longer, but views both sides of the American Revolutionary War from an unbiased perspective. It’s best for upper elementary students. Maddy Rose is a plucky young daughter of a widow. Despite being young, she is somewhat of a spy – she uses her scarlet stockings as a way to communicate coded messages! This is the story of Benjamin Franklin – as told by a mouse in a funny, witty and charming story. I haven’t read this one yet, but it seems great for teaching a bit about Ben Franklin for the kids that hate history! In this true story, Pinkus Aylee, a black Union soldier, finds Sheldon Curtis left for dead and carries him home to be tended by his mother, but when the two boys attempt to rejoin the Union troops, they are captured and sent to Andersonville Prison. This is the story of how a man and his family left Tennessee for Indiana and start a community of freed slaved in a placed called Freedom. You can get a free study guide at Adventures in Mommydom. Hope’s father has decided to enlist in the war to fight for freedom. He slips away in the night, leaving Hope uncertain if she will ever see her father again. But, right around the corner is the Emancipation Proclamation, and a surprise for her as well! These 3 books are a sweet story about a widowed mid-western farmer with two children–Anna and Caleb. The farmer advertises for a wife and Sarah from Maine answers the ad. This family goes on many adventures together and learn beautiful and sometimes difficult life lessons. The 3 books make wonderful read alouds. Ruby’s Wish by Shirin Yim – late 1800s? Unlike other little young girls in turn of the century China, Ruby’s wish is not to get married, but to go to university. It is a beautiful story of how persistence and hard work pays off. This charming picture book is also based on a true story, the author’s grandmother! This long picture book tells the incredible story of WWI, and how Christmas brought two opposing sides together peacefully during the war. I fell in love with this series (yes, it has sequels!) that make a superb read aloud. Told in short-stories about a Jewish family in New York, the “all of a kind family” is 5 sisters. 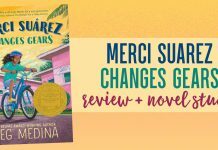 Coming from a family of 5 girls, I loved this book so much because I could relate so much to the plot – someone always has some type of drama going on! This is a wonderful story based off a popular legend of King Christian X of Denmark courageously wearing the yellow Star of David in support of his Jewish people. Despite being completely fictional, it is a nice thought, and I do believe this is something Denmark’s beloved king would have done. 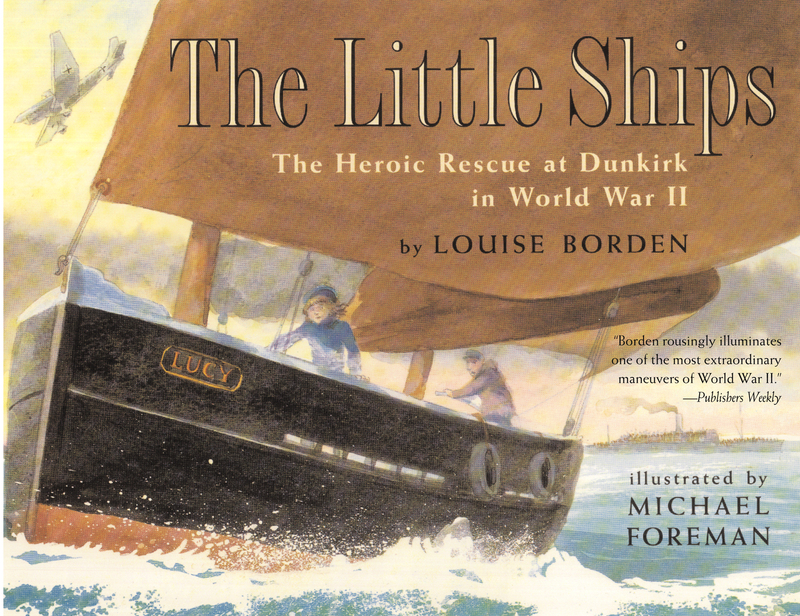 Told from the view of a fictional little girl, this picture book is about the little ships at Dunkirk, France during WWII and the massive rescue that occurred. This short chapter book is about twenty French children who rescue ten Jewish children during WWII. Everyone in the novel survives, it is non-graphic, and definitely a great children’s novel of bravery and doing the right thing. Laura Iwasaki and her family are paying what may be their last visit to Laura’s grandfather’s grave. The grave is at Manzanar, where thousands of Americans of Japanese heritage were interned during World War II. Among those rounded up and taken to the internment camp were Laura’s father, then a small boy, and his parents. Now Laura says goodbye to Grandfather in her own special way. Who was George Washington? Who was Albert Einstein? Who was Harriet Tubman? This series, about the same level as the Magic Tree House series, explores classic historical figures! This is great book of Galileo’s life and discoveries with short, interesting chapters. After each chapter there are famous Galileo quotes given. A is for the American Revolution, B is for the Battles of Lexington and Concord..explore the American Revolution – from A to Z! From spying on the British to rescuing fallen soldiers on the battlefield, the men and women recognized here stand as unforgettable heroes of the Revolutionary War. Lively anecdotes and bold paintings present a dozen figures whose courage and determination to seek freedom were indomitable. Most know about Wolfgang A. Mozart, the famous composer. Few know about his older sister, also a beautiful pianist. By the time she was 12, she was considered one of the greatest pianists in Europe, but few know her name. 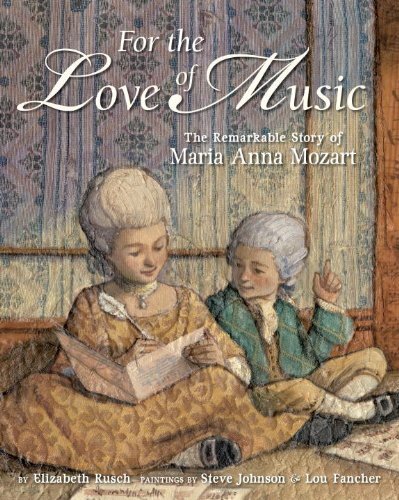 This true story, a picture book, is great for musical lovers! J is for Jefferson, T is for Timothy Matlack! Explore the Declaration of Independence – from A to Z in this fun history book! This classic picture book is about a young slave named Henry, who has dreamed about freedom for as long as he could remember. The perfect solution? Mail himself to freedom. Tells of the many events in the life of Louis Pasteur. There is fascinating detail about his experiments and struggles and triumphs from an unknown scientist to one of the world’s greatest heroes. Follow the life of Edison from “train boy” to newspaper publisher to telegraph operator to world-famous inventor. This is a fantastic children’s biography with rich, informative text and beautiful images. Edison wasn’t your average kid – so much that his mother pulled him out of school and homeschooled him. I absolutely loved this wonderful book, and it’s definitely for any brilliant but “not normal” kid! Edison was far from normal, but achieved many incredible things in his lifetime. The first cars were known as “horseless carriages.” This great picture book is how it all began! When Harry Colebourn saw a baby bear for sale at the train station, he knew he could care for it. Harry was a veterinarian. But he was also a soldier in training for World War I. 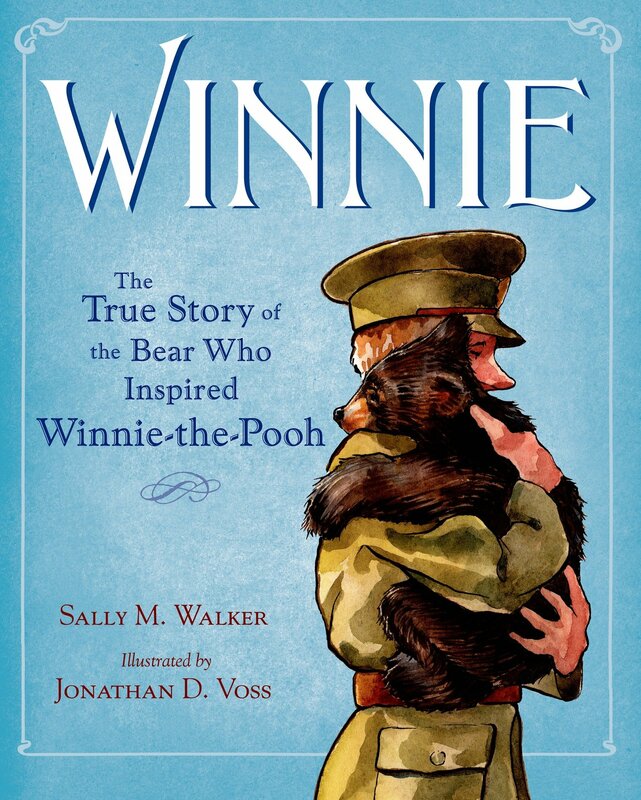 This picture book on the story of Winnie-the-Pooh is one of the sweetest picture books I have ever read, and has fantastic pictures. This is the cute story about the author’s grandparents. Young Jewish couple Solomon and Anna are madly in love. However, with Jewish persecution growing in Russia, he knows he must move to a better life in America. So he goes alone, works very hard, and pays for his beloved bride to come. As he waits for her to get off the boat, he is greeted by a surprise! I loved this beautiful picture book and I would definitely recommend it for all ages! Chiune Sugihara was a Japanese diplomat who is known for saving 6,000 Luithanian Jews by illegally writing out visas for them. This non-graphic picture book is perfect for kids. I would HIGHLY recommend it! Irena Sendler was a petite young Polish woman who smuggled 2,500 Jewish children out of the Warsaw Ghetto during WWII. 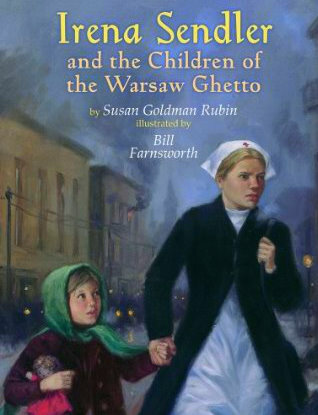 The children she rescued were hidden in convents, boarding schools, and with kind Polish families. She, and every single child she rescued, survived the war. This is her incredible story. (There’s another picture book about Irena called Irena’s Jars of Secrets but I liked this one better.) Find the book study here. This book is based on the author’s own family history through picture albums from the author’s grandmother. It’s a heartbreaking, yet inspiring story. Download a printable list here! Also check out Historical Movies For Kids, and 30+ Ways to teach History Without a Textbook! Check out part 2, for grades 5-8! Yay! 🙂 Thank you too! I subscribed so I can get the 2nd list. Replied to the email and never got the list. How do you get the 2nd list now? I was hesitating giving my e-mail for this reason. Is there a way to actually get the 2nd list after signing up? Hey Robyn! I haven’t published the list yet – it’s scheduled to release this week, and when it does, I will email you. I will not sell your email address or give it away – it is safe with me. Thanks! Great list!! Thank you!! Have you seen the Valutales books? Hmm..no, I don’t think so. I’ll have to look it up. Thanks! Haha thanks! 🙂 I try to include high-quality content only! Civil War series by Joseph A. Altsleher. He wrote each book depicting a separate key battle of the Civil War; the main characters are related and end up fighting on different sides. He also wrote other series on American history (French and Indian War, WWI, Texas); I haven’t read them, but based on this series, I’m very interested in reading them. They are available on Gutenberg and other public domain sites. It can be difficult to find them in print. 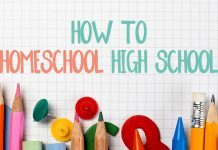 Just wanted to let you know, I shared this post in a homeschool roundup on my blog this morning. Girl, history nerds unite! Thank you! 🙂 And YES!! My daughter also loves the Time Warp Trio series. (It’s probably a good choice for boys, too, who tend to find school boring.) There is some silly “magic” involved in that there’s a magic book that transports them, and there’s some boy humor, so fair warning for those who may be bothered by such content. The You Wouldn’t Want to… series is also good for some of the youngest students. Oh, and Freedom Summer was a fantastic picture book about the Civil Rights movement. I love that it shows the depth of discrimination during that time period, but from the perspective of some children who recognize how wrong and, frankly, stupid, that was. It’s a great introduction to a tough topic. I am just SO impressed with your blog. If only all teenagers spent their time researching and writing and putting things out there that will help people! You are a blessing to the home school community and a huge encouragement to mother’s trying to home school their kids as first generation home schoolers. We are all hoping our young ones turn out a bit like you! (Industrious, helpful, sweet and intelligent.) Thanks for what you do. Thank you so very much! In our first year of homeschooling, we felt a bit lost and overwhelmed with everything. Friends and fellow bloggers have given me tremendous advice. I feel more than happy to pass on our knowledge we have learned. 🙂 Be blessed in your homeschooling journey! As a mother of 5 children, I am very interested in homeschooling, and your website gives me more faith, courage, and knowledge to want to proceed with the idea. 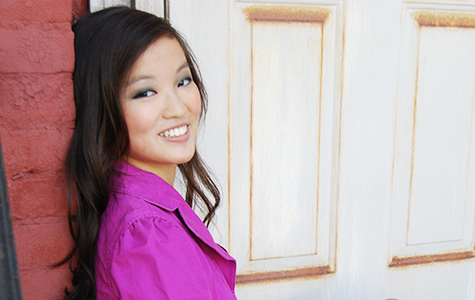 You’re a BRILLIANT young lady, and you will be blessed for sharing your knowledge/skills to help others. I have definitely been hesitant about the whole idea because I am not that tech savvy; but will work harder to improve this. Thanks for your shared knowledge, honesty, and perserverance. Be blessed! All-of-a-Kind Family–I think this is the series I have been trying to remember from my elementary school days and couldn’t!!! I loved it then…have to give it another try now. Where is the printable list? Sorry but I am not seeing it. I would like a printable version please. Hey! So sorry – I recently moved sites so am trying to get everything back up and haven’t had time to create a new printable for it! Looked for the free download on the historical titles. Found none. Love this post! Is the “printable list” available yet? Would love to take it to the library with us. Great job on your site! Hi! This is a wonderful website! Thank you so much for all you’ve put into it and are sharing here. I just wanted to let you know that the story of The Yellow Star by Carmen Deedy is not completely fictional. My father grew up in Denmark during World War Two, and his mother (a devout Lutheran), sewed stars on the coats of all the family members, including my father’s and his five siblings’. I’ve always been very proud of the Danes for the role they played in that war, and wondered why you wrote that the stars were purely fictional?! Hi! No, I meant the part that Christian X of Denmark actively wore the stars in defiance is fictional, despite the myth 🙂 I do know that many Danes did! I’m really looking forward to reading some of these books in place of a traditional text to engage my students! Thanks! 🙂 You’ll have to let me know how your students respond!